This pregnant woman found some extra protein in her French fries. And it had four legs and a tail. Actually, this was more of the opposite of a pregnancy craving, and according to Mashable, the sight of the dead lizard made the pregnant woman sick (which is believable, because ew). She reportedly called the manager to complain, but was pissed off at the generally unconcerned response she got. So she took a picture of the food and filed a complaint at the local police station. We are taking the situation seriously. Immediately upon being made aware of the complaint, we launched a thorough investigation in an effort to gather the facts of the matter... it is still on-going. The officials from Food Safety Authority have also fully inspected our restaurant including the kitchen; and have given us the permission to reopen the restaurant. We are fully co-operating with the authorities involved. It's awful and really gross that this happened, but it's not as if one can't see how it could happen. Bugs end up in food all the time (I mean, hopefully not at the same restaurant, but at restaurants all over the world) simply because that is the nature of the food-service industry. But the manager should have bent over backwards, then done a full backbend, then maybe a back flip, too, in order to make it up to the lady. He should have been horrified and apologetic. This is where customer service makes a difference. 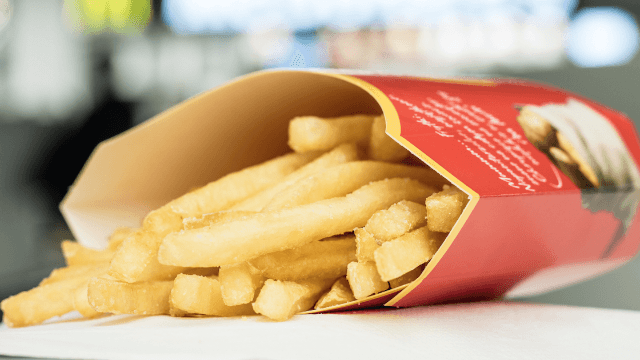 This woman is most likely never eating at a McDonald's again, and she's certainly not going to be a big fan of their French fries. It's not as if this is the first time there's ever been a story of things in fast food that definitely should not be there. Ooof, maybe just eat at home instead. (*Tugs at collar Rodney Dangerfield style*).